They’ve been months in the offing, but we can now reveal that Gory Hole‘s first painted run of Warui Zonbi: Series 1 figures will finally be touching down online later this week! Inspired by MaBa’s 80’s toy line “Zombies” (ゾンビーズ), as well as cult horror flicks from the 80’s and 90’s, the first series of finger puppet-style figures feature 2 designs; “SS Wolfgang”, taken from the classic nazi dream sequence in American Werewolf in London, and “Selwyn”, the zombie baby seen in Peter Jackson’s early b-movie classic Dead Alive. Designed by Tru:Tek with control art from fellow horror toy aficionado John Santagada of Radioactive Uppercut, the pair were both sculpted by the legendary Makino-san of TTToy, coming in scale with the original Zombies at 3″ tall, and featuring a similar split torso, capped bottom design. 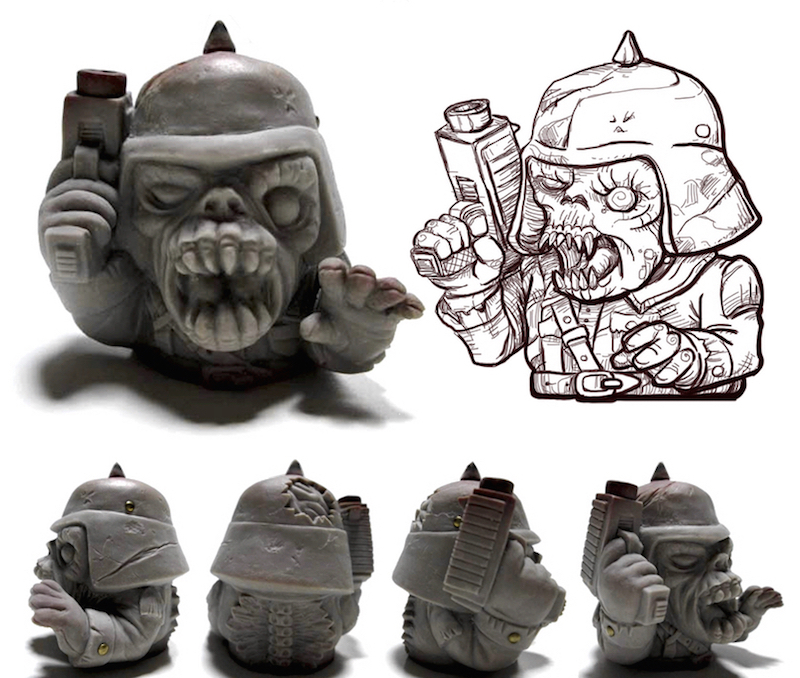 Produced in a flesh-tone soft vinyl for their first online release, an “OG” painted version from Tru:Tek will be joined by a much-requested blank run, both coming dual-packed in a deluxe display box with matching gacha-style purple keshi (find out more about these little guys in our previous post right here). Limited to just 10 sets of each, the “OG” and “Flesh” Warui Zonbis will be touching down in the Softoy Hobby/Gory Hole store this coming Friday, March 18th at 9pm London time (5pm Eastern), priced at $85 and $60 respectively… But that’s not all! Keep track of the Gory Hole Instagram feed right here for the reveal of a couple of surprises that’ll be dropping alongside the sets… No more info than that for now, I’m afraid!